Now that we’re roughly one-third of the way through the Big Ten slate, let’s take a look at the biggest surprises and storylines taking shape in the Midwest. Purdue is the clear Big Ten favorite. Who would have expected to be saying that in mid-January? It’s not that Purdue wasn’t expected to be good — the Boilers were picked to finish second, after all — it’s just that Michigan State was supposed to be that much better. Roughly one-third of the way through Big Ten play, however, that’s clearly not the case. Whereas Michigan State has lost two of its last three games, both by double-figures, Matt Painter’s club has been on an absolute tear. Since November 24, Purdue is 14-0 (7-0 in Big Ten play) with eight wins by 25 or more points — including wins against Arizona, Minnesota and Wisconsin. The Boilermakers rank among the top six nationally in both offensive and defensive efficiency while boasting the third-highest three-point shooting mark (42.6%) in America. 7’2″ center Isaac Haas has been more efficient than ever (122.7 ORtg); sophomore guard Carsen Edwards (17 PPG) has been the breakout player some thought he could be; put simply, Purdue has looked infallible. With home games against Ohio State and Michigan left, Painter’s group is in great position to win the conference outright — even if it were to stumble in East Lansing on February 10. This year’s ACC/Big Ten Challenge was a wake-up call for the Big Ten, as the conference dropped 11 of the 14 contests, including five losses by more than 10 points. Its 3-11 mark represents the league’s worst record, by far, in the event’s 19-year year history. And while it’s only fair to judge a conference so much based on a single set of match-ups in November, there’s still reason to worry. Let’s examine a few of the most glaring takeaways, both good and bad, from the four-day drubbing. The “best of the rest” might not be so great. Michigan State and Purdue were pegged #1 and #2 in the Big Ten preseason media poll, and both took care of business this week. The Spartans knocked off their second-straight top-10 ACC opponent, while the Boilermakers used a crowd-fueled second-half surge to defeat #17 Louisville. As for the remaining “upper echelon” squads? The ACC/Big Ten Challenge did not go very well. Preseason #3 Minnesota — shorthanded, to be sure — lost at home to Miami (FL), unable to keep big man Dewan Huell (23 points) and the Hurricane guards from carving them up on the pick-and-roll. Northwestern, picked fourth, mustered just 0.88 points per possession in a buzzer-beating loss at Georgia Tech. Michigan and Wisconsin were soundly defeated on the road against North Carolina and Virginia, respectively, while Maryland — just three days after losing to St. Bonaventure — fell at Syracuse. While one could simply blame the bulk of these losses on bad match-ups, that would be ignoring the fact that several of these programs were unknown quantities heading into the season. The Terps lost Melo Trimble to the pros; Wisconsin and Michigan each lost three of their top four scorers to graduation; Northwestern hasn’t finished among the top four of the Big Ten since 1968. 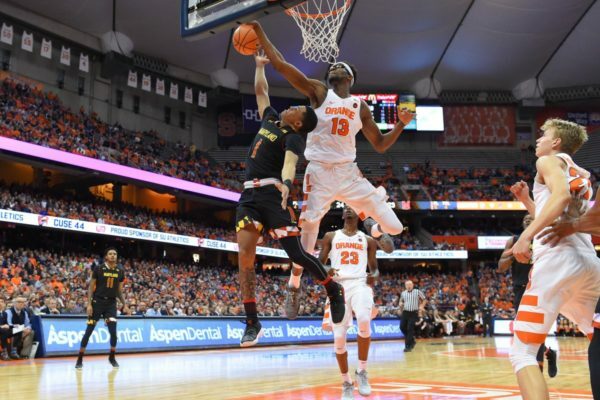 This week’s results may be nothing more than a few bad match-ups playing out in the ACC’s favor; then again, they may also be indicative of Big Ten that is not quite as deep — or simply as good — as some expected. At the very least, the one-sided outcome could do lasting damage to the conference’s seeding profile come Selection Sunday. Conference play is almost here, and after a 138-42 (.767) combined non-conference start, Big Ten teams will begin squaring off against each other tomorrow afternoon. As of right now, it looks like three front-runners (Wisconsin, Purdue and Indiana) have emerged, followed by a group of good-not-great teams competing for the top of the next tier — a glance at the most recent KenPom ratings reveals eight teams ranked within the NCAA Tournament at-large sweet spot of #29-#68. With things so relatively even, a number of x-factors around the league could very well swing the race with improved performances. Here are six players who could heavily influence how the Big Ten standings ultimately end up. 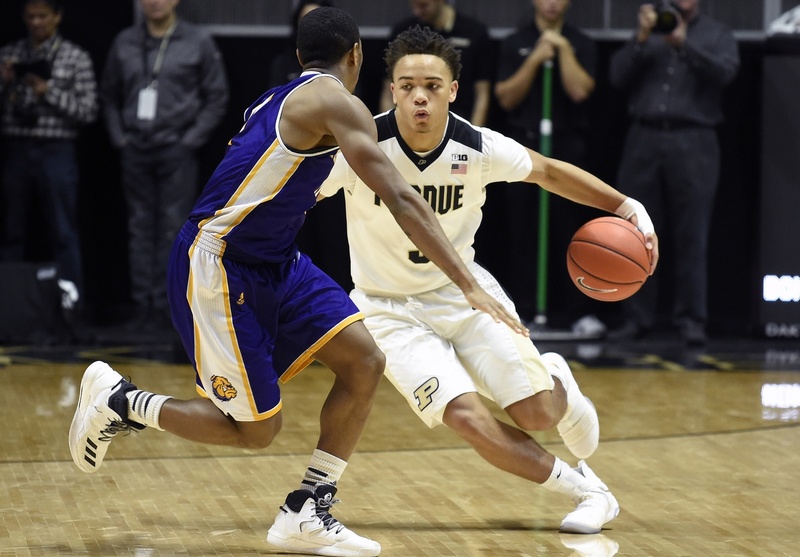 Carsen Edwards, Purdue: One of the reasons why Purdue is a perceived title threat is because the majority of their players are reasonably consistent. Edwards, however, is the biggest wild card in the rotation, and his continuing development could be the key for the Boilermakers in March. Since the freshman moved into the starting lineup on December 3, he has averaged 9.3 PPG and a couple assists per outing. His shooting can stand to improve, but he’s a blur in the open court and causes havoc defensively on the perimeter. If Edwards can become a more efficient scorer during Big Ten play (95.0 Offensive Rating on 24.9 percent usage), Purdue’s offense (as well as the team) could move into the top 10 nationally. D’Mitrik Trice, Wisconsin: With five returning starters this season, little was expected from Wisconsin’s lone true freshman. And yet Trice has been an efficient and capable third guard off the bench, including some outstanding shooting from deep so far (18-of-30 3FG). He has basically stolen the minutes that were going to Jordan Hill last season, and if he continues to give the Badgers another backcourt option beyond Bronson Koenig and Zak Showalter, Wisconsin could make another run at the Final Four.